935 Bloor St. West, look for the Clinic door, go up the stairs. Thank you to Long&McQuade for sponsoring our access to their clinic space. Lederman’s Eh?! colleagues Emilyn Stam and James Stephens will lead us as we explore “Bourrées from Auvergne” (Central France) and the Gawali Tune from Pakistan, “Sanu Ik Pal Chen”. Emilyn is a Toronto-based fiddler, pianist and accordionist who creates, performs, records and teaches in folk, trad, and neo-trad styles from Europe and Canada. You can hear Emilyn not only with Eh?! but at the Balfolk Dances in Toronto. James can be heard on a multitude of stringed instruments with an emphasis on fiddling. We appreciate your Pay-what-you-can donations for practices! 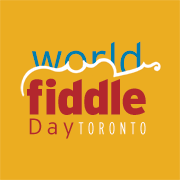 World Fiddle Day Toronto is entirely run by volunteers on a shoestring budget. We gratefully appreciate the funding from the Ontario Arts Council, all of which goes towards paying the musicians. World Fiddle Day May 20th, 2017 is coming up soon at the Aga Khan. We recommend the membership deal: for $60 you get the World Fiddle Day 2017 tunes book, workshops and evening concert all inclusive. FREE for all under 25. Bring your friends and family to the event! Non-members attend the jam for free – evening concert tickets extra. Check the website for more information or drop in to our Around-the-World Jam practice for more information. North Atlantic Drift with Dan MacDonald is at The Local on Roncesvalles, Saturday afternoons 2-4pm in April.